To continue the mystery thriller theme, today I will be reviewing Psycho-Pass, a crime drama with a unique science fiction twist. Psycho-Pass is set in the year 2113 where the mental state of the populace is measure by a government run computer system designated The Sibyl System to determine a citizen's potential for criminal activity exceeds a certain level. 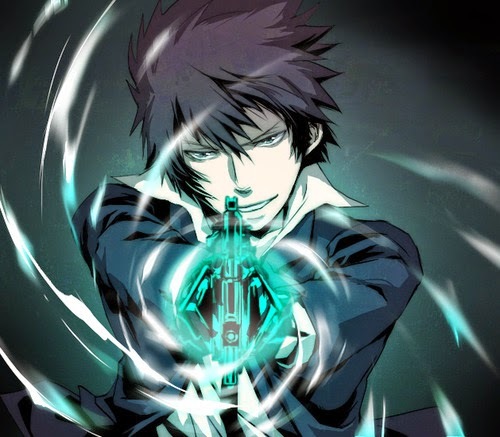 Depending on the "hue" of a person's "Psycho-Pass," Inspectors and Enforcers are task with incapacitating or killing the person in question using a special gun named the Dominator. Dominators directly measure a target's hue, and if the person's Crime Coefficient (the possibility to commit crimes) is over 100, the Dominator will be set to stun and the person is designated a latent criminal. If the Crime Coefficient the person is over 100, he or she is designated a serious threat to the society, and therefore the Dominator is set to kill. While this system may sound complex, it, along with some other aspects of the world, are explained effectively in the first episode or two. Psycho-Pass is an original work by the great Gen Urobuchi. He is famous for series such as Fate/Zero, one of my personal favorites, Madoka Magica, another favorite, and Phantom: Requiem for the Phantom. Considering the last original work by Urobuchi was Madoka Magica, my expectations were understandably high, and, for the most part, the series does not disappoint. Plot: 8.9/10- For the most part, the series follows a new inspector Akane Tsunemori, who has an unusually low and stable Crime Coefficient, which makes her particularly effective as an inspector. In Psycho-Pass' future, a person's Psycho-Pass determines the possible jobs that one can apply for, and Akane was among the highest scoring people of her generation, yet she still chose to be an inspector. As an inspector, she leads a group of subordinates, aka Enforcers, who are individuals that are designated as latent criminals. These latent criminal are sometimes former inspectors that allowed their "Hue to be clouded" (Crime Coefficient to go up) due to the nature of the job, while others are former criminals. They may have not done anything particularly criminal, but Psycho-Pass’ world is ruled by the seemingly all-knowing Sibyl System and those with the potential for criminal activity are held as criminals. Essentially, the series has an episodic narrative structure with story arcs of 2-4 episodes revolving around a case. Due to the episodic nature, not all of the story arcs are well written with one story arc (episodes 6, 7, and 8) making me lose interest in the series for a short period of time, due to how dark the episodes compared to the others, which led to a massive tonal clash. Other than that story arc, the series captured my attention after the first episode. I was sucked into this new, yet familiar, sci-fi world that both reminded of classics such as Blade Runner, which is directly referenced in the series, and new sci-fi like Almost Human. As with any Gen Urobuchi’s work, he likes to demonstrate certain themes, although, unlike most other creators, his themes are often subtle and never overpowering, and Psycho-Pass is no different. He explores some familiar themes about science fiction and society, and how a world where crime is almost a thing of the past would be like; all of which are thought provoking. Characterization: 8.3/10- Psycho-Pass has several memorable and likable main characters, as well as one of the best villains in quite some time. Akane Tsunemori is a strong female protagonist that is never too perfect to the point of annoyance. She may be a smart person, but she is still young and inexperienced, and her morals are tested throughout the series. By the end of the series, she has gone through quite a lot of character development. Akane's main sidekick of sorts is Shinya Kogami, and their buddy-cop type relationship is entertaining to watch. Kogami is an Enforcer that relies on his instincts rather than the system. His character is given a good backstory, and he is one of the best aspects of the series. Since revealing the name of the series' antagonist would spoil the mystery, let me just say that he is a very complex and intriguing villain that has elements of other iconic villains. The series' main weak point in terms of characterization is that one or two of the Enforcers are not given much development, which makes the parts later in the series where that character's role is expanded less impactful than it could have been. On the other hand, the ones that are developed, have excellent character arcs. Action: 8.2/10- Psycho-Pass is not necessarily the most action packed for a sci-fi series, but every story arc has at least one impressive fight scene, which is always entertaining. Towards the end of the series, there are several great hand-to-hand fights that are reminiscence of Cowboy Bebop's stellar action scenes with Spike. Acting: 9.5/10- Psycho-Pass is the type of series that seems to benefit from the English dub. The dark and gritty crime drama elements of the series mesh better with the English voices. Usually, I would say that both dubs are about the same, but thanks to Robert McCollum's strong performance as Kogami, and an equally strong performance from the main antagonist's voice actor, the dub is noticeably better, at least in my opinion. However, as usual, one or two of the background actors in the dub are a bit flat. As for the Japanese, it is perfectly fine, but some voices do not seem to fit all that well. Art Style: 9.1/10- Production I.G are known for their high production value and Psycho-Pass is no exception. The eyes on the female characters are a little too big, but I honestly did not mind it, and the use of spiky "anime hair" was a bit excessive, but overall, the character designs are appealing and consistent. Thanks to the dark and gritty background art, the cyberpunk aesthetic is brought to life. The use of 3D animation is actually effective, particularly with the Dominators guns. Somehow, the 3D animation used for them blends well thanks to the sci-fi art style. On an important side note, the animation for the Blu-Ray release, which I believe is the version I watched, is improved compared to the one aired on TV, thus fixing the animation problems that some criticism the series for initially. Soundtrack: 8.6/10- While not revolutionary, Yugo Kanno, not to be confused with Yoko Kanno, does a fine job with the score. The use of electronic sounds in the soundtrack provides a fitting atmosphere for the series. Humor: 7.3/10- Psycho-Pass is not a particularly funny series, but as with most crime dramas, there is enough humor spread throughout to keep things entertaining. Opening and Ending: 9.0/10- All four of the opening and ending songs are rather good, particularly the second opening and the first ending. The animation in the second opening is worthy of note for complimenting the series perfectly. Non-Otaku Appeal: If it were not for the one odd story arc and spiky anime hair, I was even recommend the series to people that I know since Psycho-Pass follows the American crime drama formula enough to feel familiar, while simultaneously departing from it enough to feel unique. However, if you do not mind one unnecessarily dark storyline and the character models, Psycho-Pass is a great series for the uninitiated, especially if you like Blade Runner. Entertainment Value: 9.1/10- The cyberpunk storylines with action and mystery are right up my alley in terms of personal preference. With the exception of the aforementioned weaker story arc, the series grabbed my interest and rarely ceased to entertain me. Overall: 8.6/10- Despite its few weaker elements, Psycho-Pass is yet another top notch achievement from Gen Urobuchi that delves into themes of this sci-fi world he created, while also giving the viewer an entertaining action and intriguing mystery crime drama that sets itself apart from the rest. Closing comments: Psycho-Pass is the type of series that fans of sci-fi, cyberpunk, Gen Urobuchi, and crime mystery thrillers will surely enjoy. If you like any of these things, you should give Psycho-Pass a watch, although, be warned that it can be very dark and mature at times. Also, season two will be airing later this year! For another opinion of Psycho-Pass, you can click here to read Arvin Saints' review of the series.